By Lisa Vaas, Ladders, Inc. 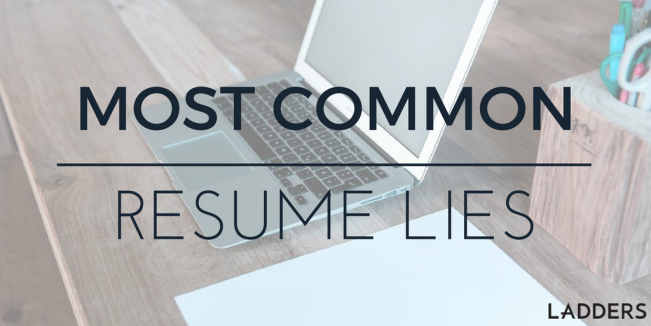 The most common places on a resume where honesty slips off the page. What are the most common tall tales Americans tell on their resumes? According to Accu-Screen Inc., a Tampa, Fla., company that specializes in employment background screening of job applicants, the most common resume lies are exaggerations and inflated numbers including dates of employment, salary and fictitious job titles. Bogus degrees and imaginary certifications are less commons, but frequent enough, the company reports. The company is expert at how and how often job seekers lie, having tracked the findings of extensive employment background checks since its 1994 inception. Accu-Screen’s reference checks reveal 8 percent of accomplishments listed in resume job descriptions to be, at best, exaggerations, and 18 percent of resumes include fake companies or lie about companies no longer in business. It’s understandable to be a little fuzzy on dates, but when years of tenure creep in to a job description, an applicant is likely hiding employment gaps. Where they’ll find the truth: A thorough reference check. Resumes magically give promotions more often than do employers, according to Accu-Screen’s data. A fudged job title often goes hand-in-hand with inflated salary on job applications. People understandably fear that their job applications will be rejected if they have a criminal history and will lie about this history regardless of how serious or trivial their crime. A much more serious prospect is presented by those who intend to repeat their criminal activity, whether it’s embezzling or criminal negligence. Where they’ll find the truth: A criminal background check. Confidentiality issues often prevent employers from divulging salary information. Sneaky job applicants can and do use this to inflate their salaries and thereby improve their bargaining position. Accu-Screen estimates that 16 percent of academic degrees and institutions listed on resumes are falsified. Job seekers also falsify 15 percent of technical skills and certifications. That includes the job seeker graduating him- or herself, claiming a degree when none was earned. Some dishonest job seekers go so far as to steal another person’s identity by borrowing their educational credentials. Where they’ll find the truth: Background screening includes verifying educational claims with universities and other training facilities. Beyond just “graduating” themselves, some dishonest job applicants are hitching unearned titles to their names. This is an especially egregious lie, given that employers are legally liable and can suffer serious financial penalties for falsely passing off employees as being credentialed. Where they’ll find the truth: Background screening includes verifying licenses with accrediting agencies. Just because you spent a few weeks putting a new roof on your mother’s house doesn’t mean you owned and ran your own carpentry and construction business for a number of years. According to Accu-Screen, applicants are currently falsifying 18 percent of past employers by making up fictitious companies or by falsifying or exaggerating information about a company that’s gone out of business. Job seekers may also use this tactic to cover up employment gaps. Where they’ll find the truth: Legitimate businesses can be verified by business licenses or DBA (doing business as) filings. Background checks will also uncover criminal records.